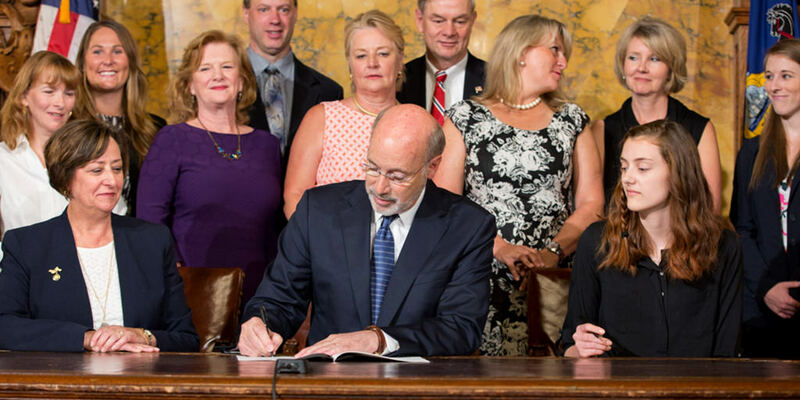 Harrisburg, PA – Governor Tom Wolf today signed legislation to establish a Rare Disease Advisory Council in Pennsylvania. The law is a step forward to help more than 1.2 million Pennsylvanians suffering from a rare disease. Act 14, House Bill 239, was introduced by Representative Marcy Toepel, and establishes the Rare Disease Advisory Council, consisting of the secretaries of Health, Human Services, and Education (or their designees), the Insurance Commissioner (or his/her designee), and members of the public, including various health practitioners, health insurers, researchers, parents of children with rare diseases, and others with expertise in providing care to individuals with rare diseases. Other at-large appointees can serve on the council on an ad hoc basis. The advisory council, which is required to meet at least three times annually, will serve as the advisory body on rare diseases to the General Assembly and all other relevant state and private agencies that provide services to, or are charged with the care of, individuals with rare diseases. According to the National Organization for Rare Disorders, there are over 7,000 rare diseases that affect 200,000 or fewer people in our country and the majority of these diseases do not have a treatment. Members of the National Organization of Rare Disorders, the Cushings’ Support Group, and other advocacy groups were on hand for the signing.